I saw a pleasant older woman walking down Broadway with a crazy big button pinned to the strap of her pocketbook. It stood out against her bright blue winter coat. “Make America Kind Again,” it yelled politely. You couldn’t miss it. MAKA. Now there’s a thought. Kindness is trending. Or, perhaps more accurately, counter-trending. I’ve noticed artists, writers and concerned citizens all over the world promoting kindness as a change agent for several years now. The publishing world calls it “up lit.” Christie Watson’s book, The Language of Kindness, out in paperback next month, is soon to be a TV series. Jaime Thurston’s action book, Kindness: The Little Thing that Matters Most, is an instruction manual for what no longer comes naturally. In this NPR interview, a former neo-Nazi explained how meaningful empathetic interactions with customers who should have hated him changed his views. Instead of polarizing, they cohesed. 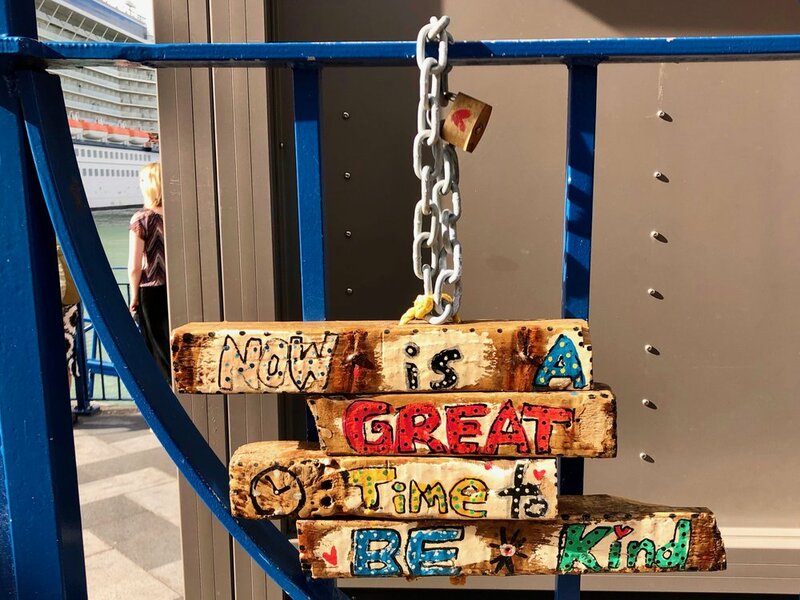 Even down in New Zealand, where civility and generosity are woven into the national character, I discovered this folk artist’s plea for kindness. It was love-locked to a railing in the Auckland harbor. Now is the time, it declares. “I believe that in the end it is kindness and generous accommodation that are the catalysts for real change,” Nelson Mandela said. Kindness is not just moral. It’s political. These days call for it. Note: This post was published just before the tragic Christchurch mosque massacre. This is the largest line I've ever seen in my life. Literally. Made up of towering 25-foot-tall paper cutouts, it was pasted outside the popular art fair, The Armory Show (March 7-11), by the French artist JR in partnership with dealer Jeffrey Deitch and Artsy. JR's idea was to secretly photoshop contemporary faces of Syrian refugees onto historical photos of Ellis Island immigrants. The piece, "So Close," not only asks the question "Who is foreign?" by mingling historical and contemporary images but also slyly points out the privilege of waiting in line for upscale experiences like, say, an art fair, brunch, or a Cronut. Dualities were evident on the sidewalk below "So Close," too. As art lovers in mink and down coats lined up outside the show's entrance, a man in traditional Pakistani garb handed out Subway discount flyers to anyone who would take them. The day was bitter cold, and he shivered in his lightweight clothes. Public art is never static. People, traffic, birds, squirrels, weather and time of day all change things up. Take, for example, Ai Weiwei's 37-foot-high steel cage in Washington Square Park (until February 11, 2018). By day, it was a total selfie magnet for tourists. At night, it ruled the park. Darkness transformed Weiwei's center silhouette (modeled after a 1937 gallery doorway by Marcel DuChamp) into a beckoning giant keyhole. Floodlights on the arch turned park walkers into miniature moving cut-outs. Perhaps the conjoined couple in the cage had just stepped out to explore the world around them? I wondered if they might snap back into place at dawn, like two missing puzzle pieces. New York City's public art performances are seldom singular. Passersby often jump in with their own twist, like this street mime in gold sequins and metallic face paint perched inside Ai Weiwei's giant Victorian birdcage structure near Trump Tower. With 300 outdoor sculptures installed across five boroughs from October to February, 2018, Weiwei's work— "Good Fences Make Good Neighbors" —evoked the global refugee crisis and the divisive nature of borders and walls. The mime wouldn't say, of course, if he was going meta on Weiwei by impishly layering a migrant street performance on a public art performance about migrants. Or was it simply a great spot for tips? I had so many questions and he had so few answers. Just a signaled preference for peace. I don't know about you, but I'm mighty glad to have 2017 in rear view. I share Whoopi Goldberg's 2018 resolution: "To be more resolute." I look around for inspiring images of fortitude all over. Above, Fernando Botero's mighty "Eve" in the Time Warner Center projects an air of unshakable strength. Naked but not vulnerable, she towers over scores of bundled-up winter shoppers seeking shelter from the record cold. I like to think there are trolls with poles underneath. If there were fish, what would they look like? Maya Lin's gorgeous and sensual Storm King Wavefield, above, is awash in living contradictions. Grass swells like water. Ocean waves mimic mountain ridges. An artist-designed tide flows to nowhere. Weeds, waves and rows of distant trees part like a classic landscape painting into fore, middle and background. And everywhere, shade upon shade of mysterious purple rust. I crave this beautiful decay, before the white. My first thoughts were of Dorothy when I came across this sunflower yellow Quaker-style house askew in the Rose Kennedy Greenway in downtown Boston. Was there a dead Brahmin stuck underneath? Actually, all Oz allusions were accidental, according to Brooklyn artist Mark Reigelman. He created this art piece, "The Meeting House," from traditional building materials like Eastern white cedar and birch plywood to reference both the residential disruption caused by highway infrastructure projects and the healing qualities of communal civic structures. As work and chores migrate to the web, I think places where people can gather and talk face to face and make progress as a community become even more appreciated. I've noticed that inviting lounges and shared worktables are super trendy, not just in expected places like hotel lobbies and coffee shops, but also in museums and even gyms. MoMA's new renovation, for example, adds 25-percent more public space, including a stunning second floor cafe and first floor lobby lounge. The stylish entrance space of my newly madeover Equinox gym fuses hotel lobby with high-tech workspace. Gym members give fingers and minds a workout while sitting at long shared work tables with electric outlets, rows of marble cafe tables or on stylish black upholstered chaise lounges. You could spend all day at the gym without breaking a sweat. The irony is that people using these public work spaces often line up next to each other staring at glowing screens like toddlers in parallel play, communing without communicating. I call it public isolation. Perhaps if a large Meeting House landed in their midst they would put down their screens and talk to each other, which is why I think some people secretly love disasters. When you contrast Reigelman's colorful small house with the large impersonal glass skyscrapers in the distance, which one would you rather play in? The minute you enter the vast dark space of "Hansel and Gretel" at the Park Avenue Armory, you have that creepy back-of-your-neck feeling that somebody or something is watching you. Indeed, somebody is. You are being surveilled by overhead night vision cameras and flying drones, and your image is being live-streamed not only to an exhibition room at the front of the Armory, but also to the Internet public here. Above, I'm taking a photo of myself surveilled taking a photo. My image is being captured from above in total darkness and projected in ghostly white onto the armory's floor. The unsettling installation was conceived and designed by artist/activist Ai Weiwei and starchitects Jacques Herzog and Pierre de Meuron to raise questions about the amount of surveillance used not only in war, but in our public spaces. I saw the exhibit the morning after I saw a theater version of George Orwell's "1984" at the Hudson Theater. It was a double helping of art-induced paranoia, courtesy of Big Brother. It made me wonder who else is watching us, and where? Alexa? Your iPhone? The hobbyist's drone outside your apartment window (yes, this really happened to a friend of mine). The bugged guest room of your host's art-filled glass house (in Elizabeth Strout's new novel, Anything is Possible)? Can we have dignity without privacy? Does spying erode empathy? Let's ask and answer these essential questions before anything becomes possible. I was walking in the park when I passed this stock-still bench sitter. If he were a sculpture, I'd call him "The Meditator." The idea of art imitating life is as old as Aristotle, but what I saw here flipped it on its back: Life was imitating art. The meditator's softly rounded back and relaxed, still presence reminded me of the lifelike sculptures of Duane Hanson, or in this case, a happier younger version of Hanson's "Man on Bench". I wondered what the artist, who died in 1996, could have created in the past 15 years if he had lived into the iPhone era. I think he would have fun with tourists and the selfie-stick. Suddenly I started seeing contemporary flesh and blood Hansons everywhere. I saw one in the stationary young woman huddled over a tripod taking a photo of the grass. In the inert, wall-leaning texter hunched over his iPhone. In the becalmed children absorbed by an iPad game on the subway. And then I realized that portable phones and screens turn us into frozen statues more often than we know. Technology has a Midas touch. A quiet tech-free meditation in the park may be the perfect antidote. Museum guards are an under-appreciated bunch. They're essential to protecting and preserving art, but we art lovers barely acknowledge their presence. They are trained to be inconspicuous, and we may pass right by them without seeing them. That's bad. Not only are we denying their physicality, we are also failing to notice the details of the entire picture. They, and us, deserve more. Artist Fred Wilson's experience as a museum guard in college lead him to create a piece that put the dynamic of the hidden guard front and center. His 1991 work "Guarded View" (now in the Whitney Museum of Art's permanent collection) shows four headless black mannequins in real uniforms from New York City museums. As Wilson remarked, "[There's] something funny about being a guard in a museum. You're on display but you're also invisible." Wilson further proved his point by showing up to give a tour of the Whitney in a guard's uniform. He was well-known in the art world at the time, but the people who eagerly awaited his tour failed to recognize him. If museums train us to "see," shouldn't we start with the people inside them? We need to embrace an entirely new etiquette, I think, regarding our interactions with the people who help make public viewing of art possible. A polite head nod or a smile would probably do it. Some guards are so spatially talented, you want to applaud them. At the Louise Lawler show, WHY PICTURES NOW currently at MoMA, I was struck by how the guard (photo above) made graphic performance art by inhabiting the door space under an exit sign. It reminded me of the guards in their booths at Buckingham Palace. This guard's act of geometric occupation counterbalanced the spatial relationships in Lawler's adhesive vinyl wall piece, "Triangle (traced)." Impeccably dressed in black-and-white, he extends rather than distracts from the monochrome wall piece. His white shirt beneath his blazer mirrors Lawler's triangle, and his clever positioning creates a three-dimensional triangle with the black-clad art observer as the point. Thanks to this stealth performance artist, aka museum guard, I had a stunning moment where art and life perfectly intersected. Construction peepholes are irresistible. For people like me, the chance to watch large machines at work as they dig and move dirt stops time cold. The view is never as surprising and disturbing as Marcel DuChamp's Étant Donnés at the Philadelphia Museum of Art, but I always think of that weird and mysterious artwork nonetheless whenever I stop to sneak a peek through a hole in the wall at a building site. I've walked by this cafe thousands of times and never thought it seemed that authentically French. But after shooting it and applying Prisma's "Illegal Beauty" setting, I'll never look at it the same way again. Once when I was driving a very familiar route home I got lost in thought, and when I began to notice my surroundings again I had no idea where I was. Even though I'd driven that route twice a day for years, I was seeing the road as if for the very first time. I stayed calm and kept driving and a few minutes later found familiar signposts that re-oriented me. The point is that looking and seeing are not the same thing. Art confronts us with that all the time. Maybe I'm late to this art party, but lately I've been having a hilarious time with apps like Pikazo, Lucid, Prisma, Waterlogged, and Mobile Monet that transform your ugly duckling photos into digital swans. I'm not patient enough for adult coloring books, one of the fastest growing segments of the publishing market, but I did once love Paint-by-Number kits. Now, with the flick of a thumb and a side swipe, I become a museum quality digital painter. Above, look what happened to my mundane photo of arranged flowers with Prisma's "Mosaic" setting on it. Okay, I know it's cheating, but it sure costs less than an MFA. Speaking of cool fruit (see my previous posts on Purple Carrots and Jumbo Blueberries), I was struck by the ability of this decaying green apple to paint a Cy Twombly-inspired line. The apple was nailed to the wall along with other fruits and vegetables in the exhibit, "Kitchen Pieces," by German conceptual artist Karin Sander at i8 Gallery in Reykjavik (the exhibit closed September 24, 2016). The veggies wilted under pressure, but this inspired apple took a strong painterly stand. I was pretty impressed by its confident use of positive and negative space, along with its bold improvisation in response to a wall environment. Critics of avant garde art like to dismiss things with "My kid could do that!" Now I might answer, "But could your apple?"